The first TAG Heuer Modular Swiss Made Watch, the TAG Heuer Modular 45. Customise your smart watch with interchangeable straps and lugs. All the features you expect from TAG Heuer connected including updates such as NFC payment function, a minimum of 25 hours battery life, multiple finger recognition touch display, Intel Cloverdale Peak Processor Dual-Core 1.6ghz, 287ppi OLED screen, & GPS. Operating on the very latest Android wear 2.0 technology to pair with your Android 4.3 and IOS 8.2 or greater devices. This model is crafted from Titanium with a black ceramic bezel & black rubber strap. Not compatible with the TAG Heuer Connected Version 1 Charger. 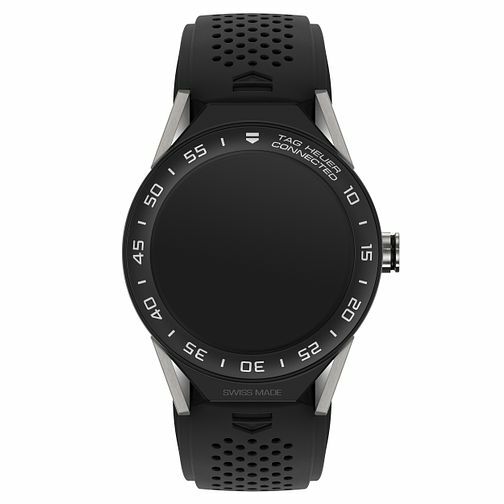 TAG Heuer Connected Modular 45 Black Strap Smart Watch is rated 2.5 out of 5 by 2. Rated 4 out of 5 by Anonymous from The product has excellent connected features Overall a superb product, however, there is a fault with 1 of the strap lugs and I have had to send the watch back to Tag Heuer for repair. I have not worn the watch for more than 1 day.